Ok today I continue the recap of my trip to Japan. Wrapping up Wonderfest … did I say it was hot ? 😉 We had a great time even with the heat… glad to see and meet up with Kajimoto-san of Toygraph who of course brought along his “hot” Space Troopers figures, he showed me a special head version from a retailer coming soon… I think will be a sell out (aren’t they all ?) and progress on a special Max Toy version was coming along fine, while this was happening we were paid a visit by Akumatsu-san President of Marmit, who by the way brought me this super giant Hedorah figure as a gift ! Holy Crap !, painted by Target Earths, Sato-san … wow…I gave him some See’s candy..seems like a fair trade..just kidding. Needless to say I was very humbled by this gesture ! As my eyes adjusted to the low light I gazed around this room… I began making out a set of airbrushes, paint cans, and toys all around… really everywhere, from floor to ceiling… and the ceiling I could touch and i’m only 5 foot 6 inches tall 😉 It was explained to me that I was lucky, he was in the middle of a big order but because of the rain he was in a holding pattern .. so he was more than happy to talk to me about painting toys ! Whoa …the first thing I asked was how many guys helped him paint.. he laughed .. “No just me”, he said ! How long he had been at this .. Oh only about 50 years ! what ? .. yep, started at 16 .. he’s now 66 years old ! He’s worked in larger factories back in the day when companies like Bandai did smaller runs of toys, but like a lot of things those days are over and that production is now overseas. But he told us of the days when companies like Bullmark would have many homes do their production work .. each home would either paint arms or legs or put them together .. each home doing a separate part in the process… for me to hear these stories first hand was a memory I will keep forever. 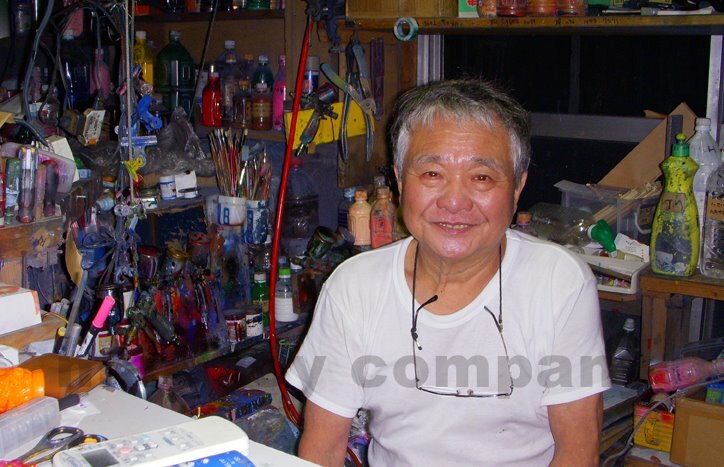 I asked Goto-san how he could paint hundreds of figures and not get bored ? He said this is what he does and thats the way it is, he paints. Ok now I really feel like a wimp for not being able to paint more than 30 figures at a time ! I noticed his hands are stained with paint, no gloves I ask ? Nope.. how about a mask? Use to but not anymore..no mask ! Sheesh … this guy is like the Ultraman of painters ! … a friend later called him, Paint Grandpa ! I’m probably not at liberty to say whom he paints for, although he said it’s Ok for me to say 😉 as he has been on Japanese TV and on a major toy makers web site, but Toy Politics being what they are today, lets say you and I will have examples of his work in our collections.. and you didn’t even know it ! He goes on to say that he works very closely with all his clients, from simple suggestions of color to full on coming up with the entire paint scheme of a toy. Did he want more recognition for his work which to the average fan goes unnoticed … “Yes, he said ! ” and laughed … I think what I want the fans to take away from my meeting with Goto-san is a lot of soft vinyl toys made in Japan are still made by lone guys, like Goto-san, still hand painting them, one at a time. I realize that even in China they are all hand done, but the difference here is this is one guy doing these runs.. from prepping to painting to hand brushing details. And though he does this on hundreds of a particular toy, each in fact is a work of hand made art. Our meeting ended and we were all awed by this humble mans strength and positive attitude… I take away a wonderful memory , some painting tips and the chance in the near future to work with this true master of paint. As we filed back out into the rain Goto-san jumped into his car and took us back to the train station. I felt sheepish that not only does he take the time to see us but has to drive us back ! I don’t think Goto-san will realize how much this meeting meant to me. We all road the train back and barely spoke, I think we all knew we had a special experience and that we are witness to the end of an era. There will be no new Goto-san in the future, even if a younger guy wanted to do this, the fact remains that you’d have to paint thousands of toys a month to just barely pay your bills, this on top of having a strong work ethic and stamina …. many traits of a by gone era in my opinion. As I am able to have these special meetings on my trips to Japan, I take away many, many special memories, that I hope to tell to others but also to somehow keep alive in my current toy company. Next up , Ultraman Festival and a wrap up !